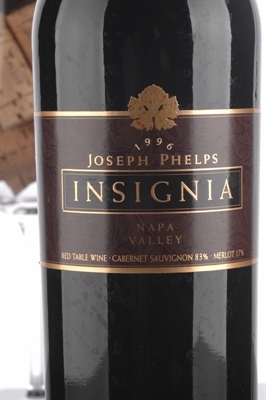 The prodigious 1997 Insignia (83% Cabernet Sauvignon, 14% Merlot, and 3% Petit-Verdot) lives up to its pre-bottling promise. Tasted on three separate occasions, every bottle has hit the bull's eye. The color is a saturated thick-looking blue/purple. The nose offers up explosive aromas of jammy black fruits, licorice, Asian spices, vanillin, and cedar. Full-bodied as well as exceptionally pure and impressively endowed, this blockbuster yet surprisingly elegant wine cuts a brilliant swath across the palate. A seamless effort with beautifully integrated acidity, sweet tannin, and alcohol, it is still an infant, but can be drunk with considerable pleasure.